In acupuncture, there are two summers. What?!! Yes, really. There is Summer – May & June, the time when everything is green, still pushing upwards with masses of energy. This has a very different feel to Late Summer – which kicks in about now, when the fields turn golden. 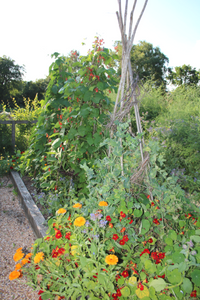 Late summer is more subtle, gentler: a time of harvest, golden hay bales, veg plants dripping with produce. It’s the season of the Earth element. Although the days are still long, dusk arrives a little earlie, but we haven’t reach the drop-off of autumn. It’s still warm, sunny, but with a more relaxed, languid feel to our surroundings. In the cycle of the Five Elements, late summer is linked to Earth. It’s the time when all that hard work in the garden and in nature comes to fruition: nature’s bounty is ripe and ready to be enjoyed. The Earth Element is enshrined in mother nature: sharing the harvest with others. If you’ve ever been accosted by a neighbour foisting their courgette harvest on you, this is the earth element working well! It is associated with the qualities of patience, thoughtfulness, and stability. Earth is nurturing, seeking to draw all things together with itself, in order to bring harmony, rootedness and stability. We need to nurture ourselves as well as others around us, to ensure good health. When Earth is in balance, we give and receive without thinking about it. When it is out of balance we can feel needy – as if nothing plugs the gap, or stubborn – refusing the give and take we need to get through life. My aim, as a Five element Acupuncturist, is to ensure that all five elements (Wood, Fire, Earth, Metal, Water) are balanced in a person. When they are, our energy flows well, and we feel well and in tune with the world. When they don’t, we feel out of sorts, not ourselves. Acupuncture helps restore the natural balance of energy within us, to help us back to health. If you’re not feeling quite yourself, do get in touch.